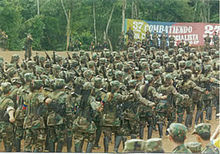 FARC guerrillas marching in formation. After 52 years, the civil war that has enveloped Colombia may be at an end. The decades long conflict has led to the deaths of some 220,000 inhabitants and resulted in the displacement of close to seven million citizens. At one time, insurgents controlled nearly one third of the country. Outside the individual losses, the cost to the country at large, has been enormous both economically and politically. The 48.5 million inhabitants of Colombia have tired of war. There is growing support for a settlement to the ongoing conflict. People living in the war zone, mostly in the remote areas of the countryside, have wearied of the continuing violence. 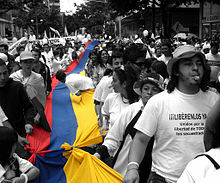 Banner of the February 2008 anti-FARC rallies with slogans in several languages. 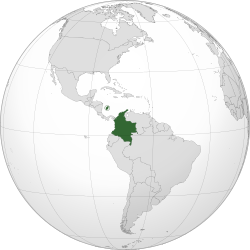 The Colombian civil war, is the longest ongoing insurgency in Latin America. A final agreement was reached on August 24, after four years of talks in Havana, Cuba. The official truce went into effect on August 29. On that date, the government officially stopped military action. The Colombian government would also like to achieve a peace agreement. The GDP (Gross Domestic Product) slowed in the second quarter to 2.0% year on year. This was down from 2.5% in the first quarter and is the slowest economic expansion in years. This is taking a toll in the public support for the present leadership. Colombia on a global map. GDP for the 4th largest economy in Latin America, has dropped from $380.19 billion USD (United States Dollars) in 2013 to $292.08 billion USD in 2015. GDP per capita as of last year was $7,447.78 USD. This is the equivalent of $12,446.56 USD in PPP (Purchasing Power Parity). Inflation reached an annual rate of 9% in the month of July and the fiscal deficit is surging. Unemployment remained just below 9%, in the second quarter of 2016. This is down slightly from over 10%, at the beginning of the year. Most of the violence had already subsided, when FARC (Revolutionary Armed Forces of Colombia) had declared a unilateral cease fire back in 2015. Only four people have been killed in the last year. The leftist leaning guerrilla group, is the military wing of Colombia’s Communist Party. It numbers near 6,500 troops and 8,500 militia. FARC will now begin to reposition their forces, so they can be later moved to 23 different disarmament camps. It is there, that they will be begin the process of reintegration. Meanwhile,the Colombian government can move forward, with the plan to offer a nation-wide plebiscite on the understanding reached. If voters approve of the text of the treaty reached between President Juan Manuel Santos and the FARC rebels, full demobilization can then take place. The peace referendum will be held on October 02 and following a successful vote, the next step would be a verification process of disarmament, that will be supervised by monitors sent from the United Nations. The next few weeks have become crucial in the peace process, in order to build trust and cooperation on both sides. General Juan Rodriquez who commands the armed forces in Colombia, will soon be informed on the location of remote units, that are scattered throughout the country’s interior. He will also receive information on the command structure of the former insurgents. Later, sometime between September 23 and the 26th the concord will be signed between President Santos and the top leader of FARC, Rodrigo Londono. He is better known locally, by the name Timochenko. Beginning this week, Colombian security forces will be deployed throughout the country to enforce the cease fire agreement. The national police will be entrusted with the daunting task of ensuring that FARC personnel will not be attacked, by those who might be seeking personal revenge. FARC is staging a conference in the rural part of southern Colombia next month. This is where local leaders of the group will be asked to ratify, what their national representatives agreed to in Cuba. The media have even been invited to attend the meeting, in a hopeful new sign of openness. The former guerrilla fighters, will now become a political movement. The Colombian government has already promised that the group will be represented in the legislature, with a total of ten seats beginning in 2018. The finer points of the reconciliation cover six topics, which although some were agreed upon years ago, others will be more challenging to bring into force. New investment for rural regions where poverty is high and infrastructure is lacking, has been ongoing. The national government itself has recognized the need, to continue programs designed to develop the interior parts of the country. Providing for greater opportunities of political participation with smaller groups like FARC, have also been agreed upon. The former rebel group has made a commitment to shut down their operations in the drug trade as well as to discourage the cultivation of coca, which is used to make cocaine. The revenue derived from these dealings, allowed FARC to raise the equivalent of billions in American dollars necessary, to conduct the decades long civil war. Terrorist attack by the FARC with a car bomb at the headquarters of Caracol Radio, the attack left 43 people injured. The main sticking point has been how to render justice to the participants in crimes, that go back many years. The FARC representatives have agreed to help to make restitution, for the victims of the insurgency. These would include murders, kidnappings, and mortar attacks on smaller communities, villages and even towns. There has been massive population displacements and the resulting loss of individual property. Many of these took place at the direction of FARC, which wanted various parts of the country depopulated. These people are demanding reparations and some sort of retribution, for what they have lost. The Colombian government had to negotiate a comprise that would achieve peace. The price for that is that many of the crimes that were committed in the name of the Marxist movement, will never be fully answered for. 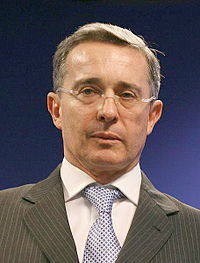 Former President Álvaro Uribe intensified military operations against the FARC-EP, seeking to defeat them. What has been agreed upon is known as a system of transitional justice. In Colombia, it will work to prevent the guilty from spending any time in jail. Once members of FARC confess, they can be sentenced up to eight years of limited movement and community service. The same penalty will apply to any civilians or even members of the Colombian army, guilty of any war crimes. The lack of real justice, has become the most contentious and controversial parts of the peace accord. There is a sizable number of Colombians who are not mollified, with the lack of harsher sentences. These individuals have found a champion in former President Alvaro Uribe. The onetime leader, waged an all out war against FARC from 2002 to 2010. Uribe insists that the insurgents who have committed crimes, must receive jail time. He is adamant that these individuals be barred from ever holding public office of any kind. He therefore is urging a no vote, on the upcoming plebiscite. Uribe holds the belief that the peace deal can still be negotiated, with these added elements. Supporters of the former president say that FARC is desperate for an agreement and will agree to a modification of the treaty, that will permit prison sentences. Unfortunately for these advocates, there is no real evidence to support their position. 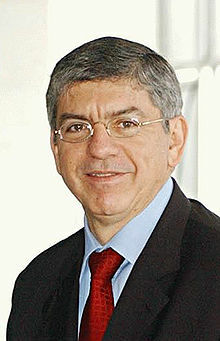 Cesar Gaviria another former president, is instead campaigning for the referendum. In his mind, this is the best deal that can be achieved at this time. It is a historic opportunity, that should not be missed. The sentiment of revenge on the part of the citizenry that have suffered under FARC cannot be underestimated, nor can the principal of law that people in the larger cities insist must be upheld. However, these people have often not personally witnessed the brutality and cost of war. This is why the plebiscite has become necessary and is not clear which way it will go. There are many people who want peace any any price and others who are willing to hold out for a better deal. Some polls show them evenly matched. There is another portion of the population that may well abstain either because they cannot make up their minds or remain indifferent. There remain major hurdles to a final peace, in addition to the referendum. Colombia still has to deal with a smaller group of insurgents known as the ELN (National Liberation Army). This organization in operation since 1964, is still engaged in kidnappings and attacks on the oil infrastructure of the country. Their leadership talks about entering in some kind of peace agreement with the government, but nothing has come of it so far. ELN is already making preparations, to take over some areas that FARC will be abandoning. This is especially the case, in regions that grow large crops of coca and marijuana. There also exists a number of criminal gangs, that originated from now disbanded right wing paramilitary groups. They are continuing operations in various parts of the country. Another problem for the government, is being able to fund the massive investment in rural education, health and infrastructure that has been promised. These costs alone are estimated to run in excess of $30 billion USD. Another big expenditure, will be the eventual reintegration of onetime FARC members. 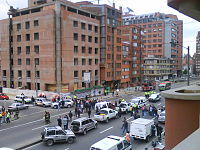 Demonstration against the violent actions carried out by armed groups such as the FARC and the ELN. The Colombian government will most likely raise taxes, in response to the need for more income. The continuing low price for oil and a number of other important commodities, have denied the government of a big source of cash. The Colombian export market remains quite dependent on crude, gold, coal, and coffee. The slowdown in the Chinese economy, is still impacting growth in Colombia. Although the country is making major efforts at diversification. 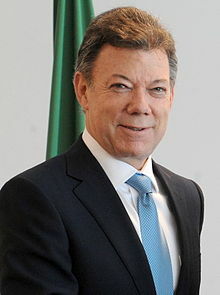 President Santos has talked about raising taxes, but not until the referendum has been approved. He is betting on a peace dividend. There will be reduced costs for military spending, now that the civil war is winding down. There is also the hope that the end of hostilities will boost economic growth, which in turn will bring in more tax revenues for the government. The one bright spot for the Colombian government is the GDP to debt ratio, it remains at a relatively low rate of just 38%. However, it has grown substantially since 2012 when it came in at a mere 32%. The problem is, will the new economic growth come soon enough? Peace will bring an increase in investment and tourism, but real development will likely be medium to long term. It will take time, to develop new agriculture and mining resources in the affected areas. The United States has pledged an additional $450 million USD in 2017, to help during the transition period. Far more money will be needed to help the country, in the difficult transition ahead. There will be major reimbursements involved in land reform, landmine removal, and other costs associated in helping areas of the country, to rebuild destroyed and inadequate infrastructure. Given the recent economic situation, the Santos government will need to move rapidly, to rebuild the country’s revenue base in the near term. This will allow greater fiscal consolidation, in bringing down looming deficits. At the same time, there is an urgent need to accommodate new investment, both internally and from abroad. The months ahead no doubt, will be a difficult period for the Colombian government.